Department of Health Convergence specially invited Professor Sengwee Darren Toh from Harvard Graduate School of Public Health, for a symposium at ECC on Feb. 19. 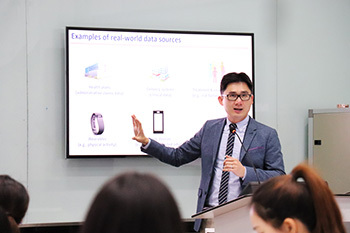 The topic of the symposium was on generating real-world evidence within distributed networks of real-world data sources. Professor Sengwee Darren Toh is also an associate of Department of Population Medicine at Harvard Medical School and Harvard Pilgrim Health Care institute. All Ewha students including new freshmen were invited to attend this special event for free.